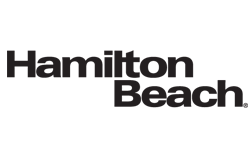 Hamilton Beach Brands, Inc. is a manufacturer of home appliances such as blenders, air purifiers, toasters, electric kettles, waffle makers, drink mixers, ovens, pizza makers, slow cookers, and so much more. Based in Glen Allen, Virginia, this company also manufactures commercial equipment that is found in hotels, restaurants, and bars around the world. The company sells their various products under several brands, one of which is Hamilton Beach. Their outdoor gas grills and electric indoor grills are sold under that brand. Nothing beats charcoal grilling – the ritual, the smoke, the flavor… but it isn’t something that can always be done whenever you feel like eating grilled food, especially if the weather doesn’t permit it. Thankfully, there’s another option for you – an indoor electric grill. And this is where Hamilton Beach’s Searing Grill comes in. When it comes to indoor grilling, you’ll be surprised with how well this small tabletop electric grill can do. 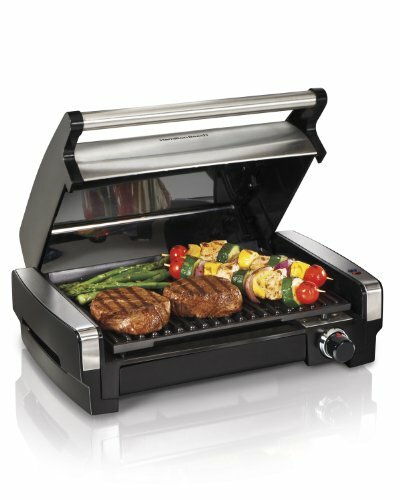 There are plenty of tabletop indoor electric grills in the market today so what makes this one stand out? A lot of things. 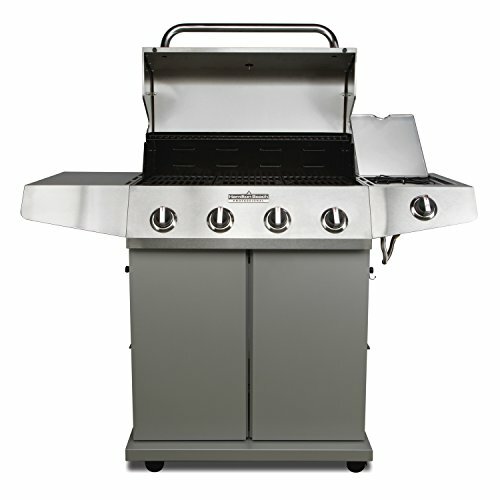 First, the grill has an adjustable temperature control – something that a lot of tabletop electric grills lack. To make that feature even better, you get 11 different settings to choose from. Second, it can reach those really high temperatures (up to 450 degrees Fahrenheit) to enable you to sear a steak. Again, a feature that isn’t normally found in indoor electric grills. The indicator lights let you know when the grill is on and when it has reached your desired temp. Third, the grate is truly nonstick so no need to pretreat the cooking grate with a cooking spray, oil, or butter. Fourth, the drip tray. There are several things to like about it. It’s extra large so you don’t need to worry about the tray overflowing if you’re cooking a lot of stuff on the grill at one time. The tray also slides in and out which means that it’s attached to the grill while in use. No need to worry about accidentally knocking it away from the grill and getting grease all over your countertop. Best of all, it’s removable and dishwasher-safe so cleaning it will be a breeze. One other thing that you are going to (or not) love about this grill is the unique hood design. Unlike a lot of tabletop indoor grills, the Hamilton Beach Searing Grill is not a contact grill. This means that the lid has no grates, you’ll need to flip over the meat halfway through your cooking time to get the other side done. The hood is actually similar to how lids work in traditional grills, by helping the grill retain heat and enabling your meat to cook via convection heat. This unique hood design also ensures that the smoke from sizzling meat is locked inside the cooking chamber, adding a bit of flavor to your heat. Lastly, the lid keeps the splatter of grease from making a mess on your counter top. If you’re in the market for a small indoor electric grill for whatever reason, the Hamilton Beach Searing Grill should be your top choice. You get a grill that heats up fast, cooks beautifully (and fast), and is very easy to clean. All good things at a fairly low price. 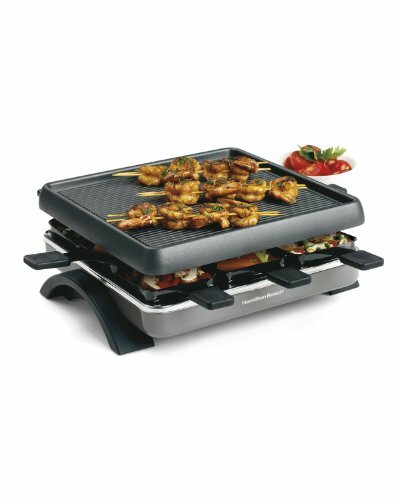 If you’re looking for more versatility in your indoor grill, then the 3-in-1 Grill/Griddle might just be what you need. increases your flexibility in the kitchen – you can cook use both of the grill sides of the cooking grid for steaks and burgers, use both of the griddle sides for pancakes and bacon, or cook some steaks on the grill and some fajitas on the griddle at the same time. no on and off switch which means plugging the appliance to an outlet turns BOTH sides of the grill on even if you only want to use one. You’ll need to turn down the heat to a minimum on the unused side or just use both sides since they’re both turned on anyway. not all of the grease is drained from the cooking surface. 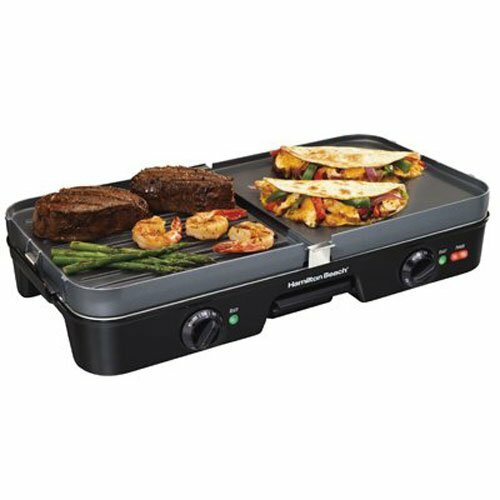 The 3-in-1 Grill/Griddle is an indoor electric grill that offers versatility at a very low price. Though it has some flaws (what grill doesn’t? ), the benefits certainly outweigh them. You don’t get what you pay for with this little grill. You get more. Grilling can be fun but it’s always done by a party of one. But with the Hamilton Beach Raclette Party grill, each member of the party participates in the fun by making their own meal. Cooking is made a lot easier with the use of the baby spatulas which are often not included with other raclette grills. the grill is more for a party of 4 than a party of 8. Though there are 8 trays, the top grill can only accommodate food for four people at a time. no on and off button, just plug it to turn it on. If you’re looking for a fun way to grill with your friends, you definitely have to have one of these. A lot of good raclette grills are expensive so finding one with this quality at this price is a chance you shouldn’t pass up on. 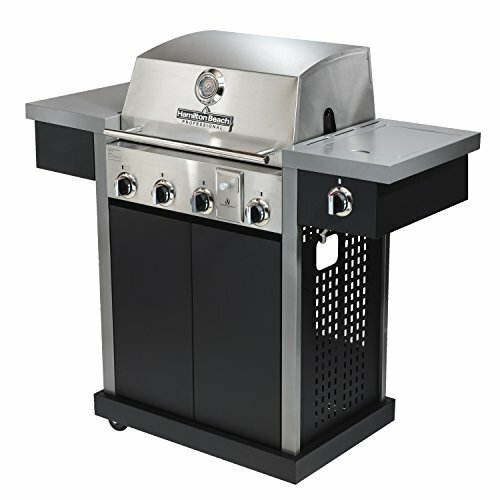 If you want something bigger and better than an indoor tabletop electric grill, Hamilton Beach also offers outdoor gas grills. The GrillStation 5-Burner is Hamilton Beach’s first foray into the gas grill business and it shows. While the GrillStation 5-Burner is able to grill various types of food pretty well, it doesn’t really stand out much in terms of cooking performance among other gas grills in the same price range. Despite the added frills (interchangeable grill surfaces and a dedicated smoker box with burner), the uneven heat distribution, flare-ups, and other drawbacks makes it more of a decent grill rather than an outstanding one. It certainly isn’t a bad grill especially at this price point but there are so many others you can choose from that may meet your requirements more. Assembling a huge gas grill can take anywhere from 2-4 hours even with a bit of help which means that it will definitely take a while before you get grillin’. For this very reason, Hamilton Beach decided to produce a gas grill that can be assembled within 10 minutes – The Professional Quick Assembly Grill. The grill comes partially assembled in the box. Simply unfold it and with the help of a Phillips-head screwdriver to attach the side shelves, you’ve got your grill set up and ready to go. Based on customer reviews, the grill is very easy to assemble. Most were able to finish setting up the grill within 10 minutes while others took up to 30 minutes. Not too bad considering some gas grills out there take as long as half a day. As for its cooking performance, this quick assembly grill does deliver. Plenty of praise from users on how well the grill performs in cooking various types of meat. And unlike the GrillStation 5-Burner from the same manufacturer, this one has minimal flare-ups. The grill is easy to start, the temperature gauge is easy to read, and the controls are easy to use. All in all, a very easy grill for any novice outdoor chef to navigate. Also a big plus, the grill has a large cooking surface which can accommodate around 28 burgers at a time. Perfect for those who have a large family or plan to hold plenty of backyard barbecues with a large party. There are some drawbacks to take note of. One, the grill has uneven heat distribution. Two, there have been some complaints regarding the quality of the materials used in making this grill which, of course, results in questions regarding its durability. While it’s certainly not a Weber (which we already know can last decades and are passed on from one generation to another), at this price point, it’s fair to say that the quality is up to par. There have been no stories regarding the breakdown of this grill after a couple of months of use. On the contrary, it seems to be doing quite well despite being a “folded”, easy-to-assemble grill. If you’re in the market for a grill that’s easy to build (less stress for you) and can deliver deliciously grilled meals, then you’d better check out this one in a store nearest you.